On Sunday 11th June 2017, another episode in my ongoing investigation into the agency of future cities images and their 'ghosts in reverse' took place as part of the Antiuniversity Now umbrella of events. 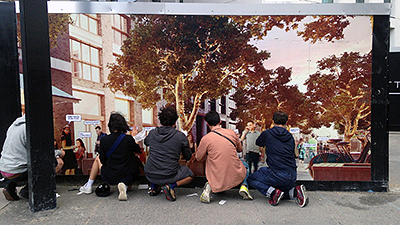 It involved the assembly of an improvised group of volunteers willing to take on a collaborative act of scriptwriting for the characters featured on the hoarding of a Barratt development in Aldgate East, called Aldgate Place. In the space of four hours from beginning to end, the impromptu collective gathered, discussed, collectively wrote, produced and then applied custom-designed speech bubbles into the world of the yet-to-exist community of Aldgate Place, giving the gift of public speech to these ghost citizens in public space. In doing so, the artificial 'cut-and-paste' ghosts of Aldgate Place became animated by our temporary community and turned into channels for urban narratives of repressed vitality, tough predicaments, confrontation and criticality. These unsolicited insertions are liberated into a discursive space opened up at the boundaries between the affective atmosphere of the Aldgate yet-to-exist according to Barratt and the future imaginary of the spatial reality it is aiming to colonise through its affect.